Bacteria beds are also known as trickling filters and have been used in the biological treatment of urban and industrial wastewater for over 100 years. As described in attached growth processes are attached growth biological reactors that are not submerged. These reactors use a traditional contact material (Pozzolana, pebbles) or plastic over which the water to be processed is continuously distributed. The traditional fill bacteria beds, on the grounds of the drawbacks quoted in chapter fundamental biological engineering processes applicable to water treatment, have practically been dropped now in favour of plastic fill beds or other biological processes. Plastic bacteria beds are circular, octagonal or rectangular, varying in depth from 4 to 6 m. The material is laid either over a grating or over a system of beams designed to prevent fouling and to encourage air circulation. With the exception of some special schemes, the liquid collected beneath the filter is routed to a secondary tank where it is separated from the sludge that is produced. A fraction of the liquid collected beneath the filter or of the clarified effluent is recycled to the bacteria bed intake where it is used to dilute the water to be treated and to ensure that the biofilm is adequately «wetted». In view of the process’s fouling susceptibility, the bacteria bed treatment is used preferably after a 6 mm of straining and a primary settling or after a only fine straining (mesh smaller than 3 mm). Possible bacteria bed applications involve the elimination of carbonaceous pollution on its own, combined elimination of BOD and nitrification, and tertiary nitrification after secondary treatment. 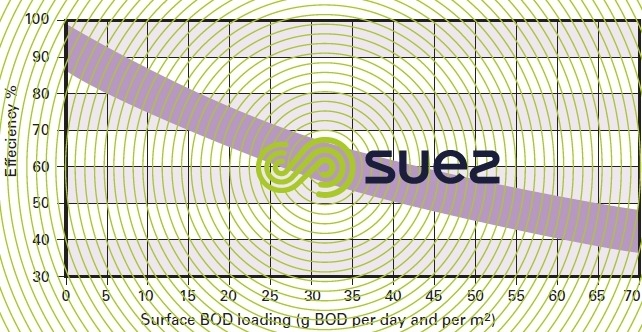 As plastic substrate specific surfaces can vary widely, the most appropriate reference used will be the surface loading density (in kg BOD · d–1 · m–2 of developed surface area) rather than the BOD loading (kg BOD · d–1·m–3). This criterion provides a better appraisal of process efficiency. 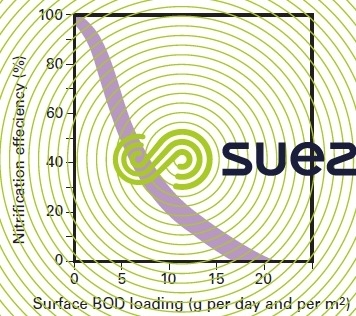 Figure 28 provides the estimated BOD removal efficiency according to the surface loading density applied. With a typical primary settlement urban wastewater, a surface loading density of approximately 5 g BOD · d–1·m–2 will produce a discharge having less than 30 mg · L–1 of BOD. In principle, BOD elimination and partial nitrification can be carried out in one single treatment stage. However, given the impact made by the BOD loading, it is often better to use two or even three stages in series, with intermediate settling (figure 29). Under these conditions, the use of a bacteria bed for tertiary nitrification will produce an 80% efficiency for nitrogen ammonia, for a surface loading density of approximately 1 to 1.5 g N-NH4 · j–1 · m–2 of developed surface area. To conclude, it should be noted that, although simple in appearance, trickling filters are in fact highly complex systems in terms of internal hydrodynamics and biological kinetics. Their dimensioning, therefore, can only be based on empiric formulations derived from pilot studies and from results achieved with treatment plants.